The US stock market is soaring, commodity prices are on the rise, and there are signs that consumer confidence is growing. Ask the US government if the recession is ending and you’ll hear a resounding yes as the Obama administration rushes to claim an early victory. Naysayers however point to the massive US debt and the 10% unemployment rate as signs that, even with the economic stimulus package, we still have a long way to go. 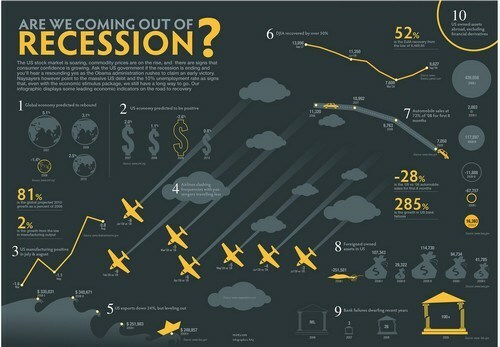 Our info-graphic displays some leading economic indicators on the road to recovery.